I wish I had listened when my father told me stories about his life. I had no idea the fascinating history behind his words. 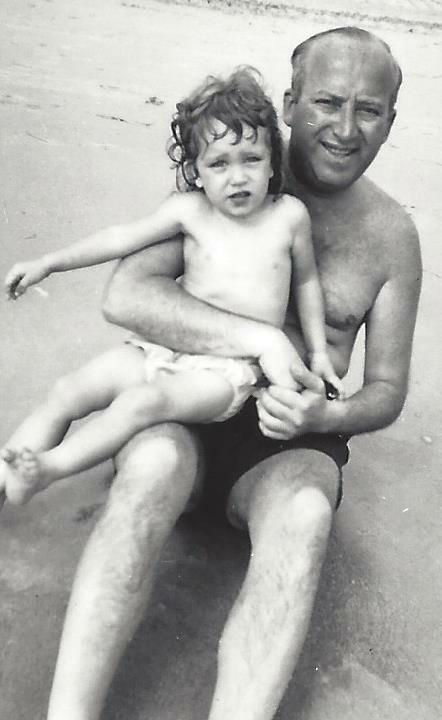 My father, Harry Levin, grew up in New York City’s lower East side. His parents immigrated through Ellis Island from Russia in 1897. 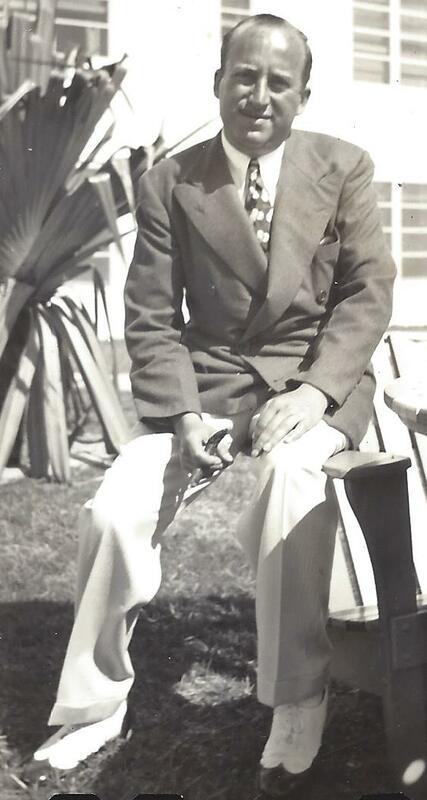 He was born in 1904 and went to school only through the third grade when he began working in the garment district. Despite his lack of a formal education, he became exceptionally sharp and wealthy as a bookmaker and ticket scalper. He was unlike any other man I’ve ever known. For one, he always wore a suit. Dressing casual meant not wearing a suit jacket. And he often wore a hat – removing it indoors and tipping it to the ladies. He was a kind and gentle man with a great sense of humor. He was mostly bald, smoked cigars and always carried an enormous roll of cash. I can still see him flipping through it. My parents lived in Flushing, New York when I was born in 1946 and we moved to Miami Beach three months later. They divorced when I was five and my mother and I moved to a small town in Ohio. Despite the distance, my father kept in constant touch with me and we visited a few times a year until I moved to New York City to attend The Wood School in 1965 and lived at The Barbizon Hotel for Women. Many of my father’s New York friends were household names such as Meyer Lansky, head of the Jewish mafia. They grew up in the lower East side in the early 1900’s and were close in age. Lansky’s family also immigrated from Russia. He was instrumental in the development of the “National Crime Syndicate” in the United States and for decades was thought to be one of the most powerful people in the country. I’ve been told he appears in my home movies lounging around a pool in Miami Beach with my parents. His son, Buddy, got his first job at the theater ticket agency where my father worked in New York City–where someone was shot and killed in a mafia hit. Since cell phones hadn’t been invented yet, my father would stop numerous times throughout the day to make telephone calls at pay phones, checking on bets for the horse races. And at exactly 3:00 p.m. he would dodge into a bar and get a shot of Old Grandad which would be repeated a couple more times before dinner. His daily activities were planned around the horse races, primarily Aqueduct. When I was ten, my father took me to a hockey game in Detroit. While sitting in the lobby of our hotel, I heard a man yell “Harry!” It was Eddie Rickenbacker, World War I American Ace and President of Eastern Airlines. They greeted each other like long lost buddies and talked for quite a while. After we left the hotel for the hockey game, my father told me what an important person I had just met. On a visit to Lindy’s Restaurant in New York City to meet some of his cronies, he introduced me to Milton Berle. He was seated at the head of a long table of men having breakfast – reminiscent of Damon Runyon characters — he was just another one of the guys. Frank “Red” Ritter, another friend of my father’s, set up gambling operations in the Bahamas with Meyer Lansky’s money. I first met him and his son, Frank Jr. (who was my age), at the Eden Roc Hotel in Miami Beach. When I was living at The Barbizon Hotel for Women in New York City, Red, his wife and son, picked me up in his chauffeured limousine and we went to an exclusive Italian restaurant the Ritters frequented and we had dinner in our own private dining room. I dated his son a couple times and visited their home. In 1967, Red was under indictment for violating federal anti-racketeering statutes and wasn’t allowed to leave the Bahamas. My father also mentioned names to me like Bugsy Siegel and Joey “The Greek” Adonis — he knew them all. He was protective of me as well. When I lived in The Carleton House on the upper East side, I learned that he slipped the doorman some cash to keep tabs on me. He had connections for everything. He would tell me to shop for certain brands of clothes, give him the numbers of whatever I wanted and he would send them to me. When I got married, he used his connections to get a Rabbi in Carnegie Hall to marry us and he used his connections to completely furnish our first apartment and the list goes on and on. Throughout my life my father told me “When I die, you will be well taken care of.” Just before he died, however, my mother (divorced over twenty years from him) did the unthinkable. She took her attorney/lover to my father’s bedside at the hospital and had him sign everything over to her. I didn’t know until years later when going through her legal documents. Even though I didn’t inherit anything from my father’s estate, the Universe has taken good care of me and I know my father is watching over me from the big race track in the sky. can be read on her website www.melodeecurrier.com. Mel is an occasional contributor to True Stories Well Told. When we’re young, our parents’ friends and the family we are surrounded by are all simply what we know—they create our “normal.” It’s very rare that a child recognizes how special some of those people may be, whether to them as an individual or to the world at large. In this case, though, wow—what a world Melodee was exposed to: an array of characters that have been written into the pages of history! It’s touching that, in the end, it wasn’t the larger-than-life folks that she remembers most, but her father’s love and idiosyncrasies—and his desire to take care of her, always. Thanks for sharing! I hope this will be followed by a book!